Carole Bolsey’s “Surge Left II,’’ a new work at the Thayer Academy Gallery. Reception Sept. 14, 6 to 8 p.m.
Carole Bolsey is painting the world. The Kingston artist with the national reputation will show her new large canvases along with several extra-large painted screens in the first exhibition at the newly restored Thayer Academy Gallery in Braintree. These screens and paintings have never been seen together before. But with the publication of that book two years ago, Bolsey realized that as an artist she had “closed the book’’ on a phase in her career. It was time to allow her inner wild woman out to paint the biggest subjects that compelled her attention - light, water, awe. The Thayer exhibition will show six or seven new paintings and two or three screens, depending on how much the gallery in the restored Southworth Library can comfortably hold. Since both sides of the screens are painted, each offers its own “interior season - an atmosphere, a quality that contrasts with the other side,’’ she said. One side may suggest a dark interior and the other a brilliantly lit outdoor beach scene. The painter and her husband, film lighting technician Twig Johnson, have been staring up at the moon for three years while immersed in warm water on winter nights. “I never want to go indoors,’’ Bolsey said. In addition to spying on the cosmos, the experience provides an evening’s relaxation from the physical side of working on 7-foot canvases - painting a stroke, then scrambling back 20 feet to see the effect. Bolsey’s new paintings, made since the publication of the book, are so large “they feel like walls that aren’t there,’’ she said. Water figures largely in images such as “New Boats,’’ in which circles spread over the surface of the water like representations of planets circling the earth. 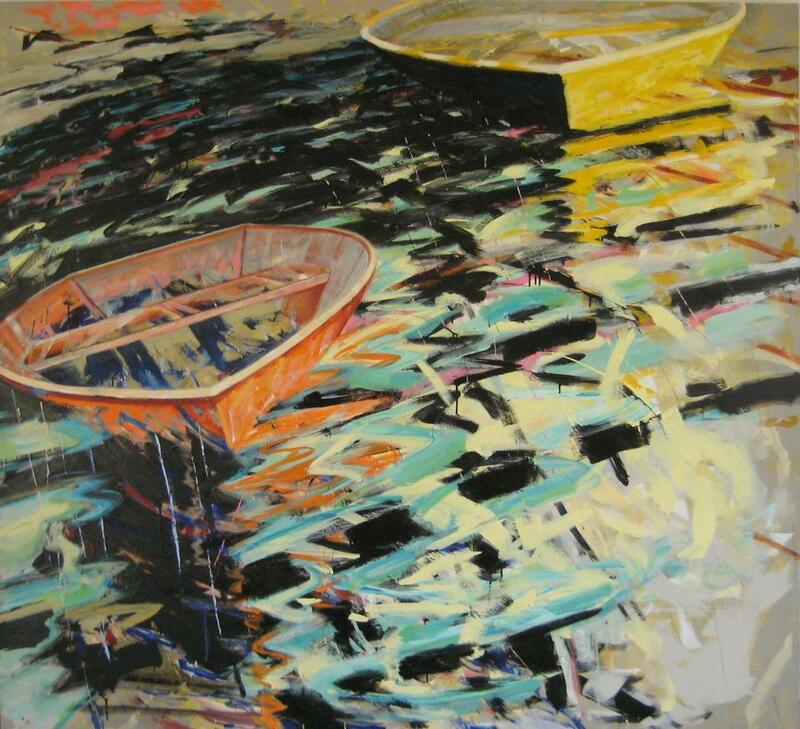 In “Surge Left,’’ a water surge depicted from a tilted horizon appears to be pushing the boats off the canvas. Bolsey said “The Shape With No Name,’’ containing large color reproductions of her works, gave her a push in a new direction both liberating and terrifying. Its meaning was reinforced by the death of her 24-year-old cat, a longtime companion, and the arrival of a new kitten. The message? “I may not live forever,’’ she said. “It was time to paint without constraint’’ and release the wilder side of her vision. But as an artist it’s her job to see how they tie together as well, Bolsey said. Whether it’s by watching the moon pass over the house or the endless lapping of the waves on the shore, light and water are the avenues into a sensibility that the painter’s new work seeks to express. Robert Knox may be reached at rc.knox2@gmail.com.